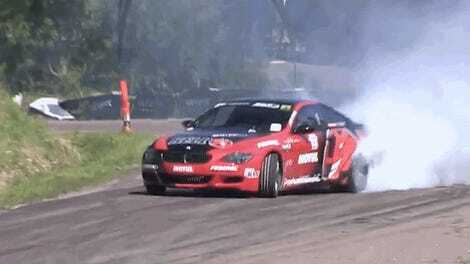 This is Luke Fink’s BMW E46 drift car. In this BMW E46, there is a BMW S85 V10. It sounds like a dentist drill big enough to put a hole in a building. The V10 itself was big enough to put a hole in the hood, at least. Also, it shoots massive flames. Fink is competing in the King Of Desert drift championship, running at Yas Marina in the UAE this weekend. I imagine I’ll be able to hear him from here.